Icon modes highlighted in red. Whenever I teach shooting modes, I always get the same question from members of my class, so I'm going to attempt to deal with that one right off the bat. The question is: why do I need to learn how to set my camera's settings manually when my camera already has built-in modes for sports, portraits, landscapes, etc? (These are, by the way, referred to by photographers as the icon modes because they have icons of the shooting situation on the mode dial). Again, an example will help to explain why these icon modes won't work for those who want to become a “real” photographer. With your new photography skills and your new fancy camera, your family members nominate you the official photographer at your family reunion. It comes time to take the giant group picture with over 60 people in it (including your Uncle Bob who really shouldn't have worn that ugly Hawaiian shirt). What mode do you set the camera to? The little portrait icon, because it's a portrait! But there is a problem… a really big problem. The portrait mode on your camera automatically makes the aperture go really low, because it thinks you want shallow depth-of-field in your portrait. But in this instance, it's such a large group of people that you need full depth-of-field so that the people in the back aren't out of focus. The camera doesn't know your intentions with this portrait, so half of the group looks blurry. And thus we see why the little automatic icon modes (the landscape, portrait, sports modes, etc), simply will not work for photographers who want to learn to take professional-quality photos. Creative modes highlighted in yellow. If you use a Canon DSLR, then you'll see that your camera company likes to feel “special” by changing up those names. Canon cameras will show “P, Av, Tv, M” for the same exact modes. 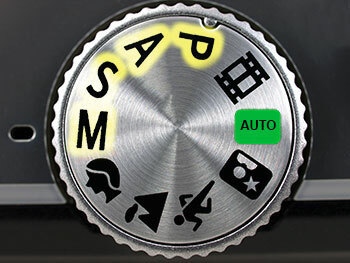 “Av” is Canon's version of Aperture Priority, and “Tv” is Canon's version of Shutter Priority. It may feel a little bit intimidating to move to these creative modes on your camera, but I'll walk you step-by-step through each of the creative modes, how to use them, and what they do. Just trust me on this one–you don't want to use it–ever. But just in case you're curious, program mode usually (it is slightly different on each camera model) sets the aperture and the shutter speed for you, and allows the photographer to set the white balance, ISO, and flash. This mode is not a great choice for serious photographers because you can't set the shutter speed to make sure the picture isn't blurry, or the aperture to control the depth-of-field. I'd love to see you use aperture priority for 95% of your shooting for the next several months. It is the mode that most hobbyist photographers and even many many pro photographers shoot in most of the time. When you shoot aperture priority mode, you set the aperture (the f-stop) and also the ISO. The camera will then set a shutter speed for you so that the picture is properly exposed. Aperture priority mode is powerful because it is amazingly simple to use, and still allows the photographer a lot of creative choice. In fact, most competent photographers use aperture priority mode every single day. Suppose you're shooting friends and family at a party. The background is really busy with people and things around the house, so you decide you want a blurry background in the photo (shallow depth-of-field). To achieve this, you set the camera to f/3.5 which is a low aperture and which will blur out the background. The first picture you take is of a person sitting on the couch next to a lamp. The lamp is bright, so you want a fast shutter speed to get the correct exposure since your aperture is wide open. Using aperture priority mode, the camera would automatically set that shutter speed for you. Then, you want to take a picture of someone in a darker corner of the room. You wouldn't have to fiddle with camera settings at all, because the camera will automatically see that it is dark and choose a slower shutter speed. All the while, you're able to keep the aperture set to use creative depth-of-field. If I could only teach you one thing in this photography basics series, it would be to set your camera in aperture priority for the next six months. When you want full depth-of-field, choose a high f-stop (aperture). When you want shallow depth of field, choose a lower f-stop. Your pictures will DRAMATICALLY improve when you learn to control the depth-of-field. Shutter priority mode sounds very useful, but the truth is that I have never found a professional photographer who uses it. It is a bit difficult to explain why that is. At first blush, it sounds convenient to have a mode where you could choose the shutter speed and ISO and let the camera choose the aperture for you. For example, when shooting a school basketball game, you might think you'd want shutter priority mode because you could set the shutter speed fast enough for the quick-moving sports situation. However, you might be surprised to learn that nearly all professional sports photographers I've worked with shoot in aperture priority mode. Why? Because the depth-of-field is key. We want to control depth-of-field in our sports pictures and we just keep an eye on the shutter speed to make sure the camera isn't picking one that is too low. If it does, then we boost the ISO so that the camera will chose a faster shutter speed. When I was 16 and drove a car for the first time, my teacher took me to a large parking lot. He asked me to floor it as fast as I possibly could across the parking lot. This was my first time driving! So, I went for it. I felt like I was FLYING! Then, he told me half way across the parking lot to look at the speedometer. I was only going 10 miles per hour (16 kilometers)! The point is, the first time you try anything, it feels intimidating and like you're out of control. The first time any of my students use a camera in manual mode, I can see them terrified to try it out. However, shooting in manual mode really isn't as difficult as it may seem. To understand manual mode, the example below will be helpful. I took the picture above while at a photography conference in San Francisco. 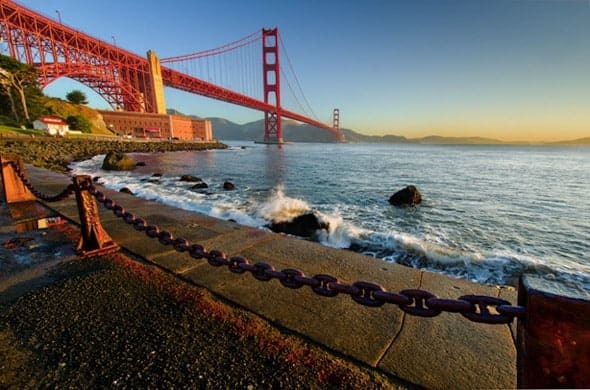 In a situation like this, the bridge isn't going anywhere, the bay isn't going anywhere, the chain in front of me wasn't going anywhere… I had a captive audience to say the least. In situations like this, I always use manual mode. I then set my shutter speed to 1/100. I set my ISO to 100 because I wanted no noise in the picture and I knew if I needed more light, I could just slow down the shutter speed. After taking the picture with the settings above, I realized that the picture was coming out a bit too dark with 1/100 shutter speed. So, I slowed it down to 1/60 and it looked just how I wanted. The point is that, eventually, you'll find yourself wanting to shoot in manual mode for situations where you aren't rushed to get the shot. If you're shooting sports, outdoor portraits, or other things, then aperture priority is simpler and faster than shooting in manual mode. But since you're still learning, the best option for the next few months is to get comfortable shooting in aperture priority mode 100% of the time. In the next lesson in this series, you're going to learn how you can dramatically improve your pictures by using creative compositions. We're past most of the technical stuff for now. I thought you would like to know that you have some code exposed in one of your paragraphs. @Jason – Fixed. Thank you! Your posts are extremely helpful. Not just for pros but for beginners as well. Thank you for taking the time to write these out some anyone at any skill level can improve and understand. Thank you for this wonderful breakdown. I am a beginner and I have been completely overwhelmed by all the web as to offer and figured this new hobby was obviously not for me, until I found your website. I’ve always felt that I have a great eye and capturing it in a quick snip-it was exciting for me. I now better understand the intricacies and how to utilize them to bring my vision to life. Still fine tuning, but much more confident. Thank you for this article, really helped me a lot. Very nice article and very easy to understand.Yes.. I think you have given a very correct advise to stick to aperture priority mode AV mode. I am an armature photographer and Canon user.I have Canon 600D DSLR camera with 18-135mm and 50mm (1.8) canon lenses in my bag.I also have Canon 55-250 zoom lens presented to me by my son. Now I will strictly stick to your advise and will take photographs on AV and manual modes. this is the simplest explanation i av gotten for handling a digital camera so far. keep it up. this really helped my confidence. I’ve had a Canon Rebel T3 for over a year now. I thought I would pick it up and miraculously have amazing pictures. I’ve had a few flukes and gotten a couple of incredible pictures, but for the most part they aren’t much different than what I take on my point and shoot. I came across your website yesterday as I am feeling inspired to really learn how to use my camera this year. I noticed you have classes and I will definitely be taking some of those this year. But until I am able to do so I’ve been very pleased reading this series. I feel like I’ve learned a lot already. I do have a question though. As I was reading this post I was inspired by your example for the Aperture Priority mode so I decided to try it out around the house, shooting for a blurry background. I set my aperture to f/3.5 and my iso to 800, though I played with that both higher and lower. Each picture I took the background was as crisp as the subject. I also switched between manual and automatic focus. Nothing changed. I was wondering why that might be? My lens is the kit lens my camera came with 18-55 mm, if that makes any difference. Thanks for sharing your insight. As a new aspiring photographer I’ve enjoyed reading your blog and learning more. I also has a Canon T3 with a kit lens and a zoom lens. Photos from zoom lens are mostly amazing and sharp. Photos from kit lens are mostly blurry or out of focus. I have tried manual mode on both lens. There is nothing you can do with kit lens. You need a better lens. Larry, that is not entirely accurate. While better lenses can improve your images, what Elizabeth is likely describing is an issue with depth of field and lens compression. You can create a blurred background at nearly any aperture if you set the subject far apart from the background and position the camera close to the subject. If she is shooting around the house at f/3.5, the “subject” is probably the room and its contents. If she were to focus on a single object near the lens and create distance between the subject and background (the rest of the room), she would be able to produce an out-of-focus space behind the subject, regardless of the type of lens chosen. It looks like the “kit lens” that comes with the T3 is an 18-55mm (which, incidentally, is a zoom lens). Using a different lens can allow you to set a wider aperture (for example, a 50mm prime lens may allow you to open up to f/1.8), but if everything in your frame is on the same plane (i.e. the same distance from the camera), all of the objects will still appear to be in focus and the shallow depth of field will not be apparent. It’s really hard to produce blurry backgrounds with the kit lens. The aperture at f3.5/ 18mm is not large enough to produce this effect. Depth of field (dof)/ blurriness also depends on your distance from the subject as well as the subject’s distance from objects in it’s background. You might get better results if you shoot at 55m and move in close to the subject while it is farther away from it’s background. But for more control over blurriness/ dof you may want to invest in a fast lens. By fast lens I mean low f-numbers. The 50mm f1.8 is a cheap lens, cheaper than your kit lens but allows you to step down to f1.8 and this will produce more blurriness in the background. I have the Nikon d3200 and have just started playing with the aperture setting. The whole pic is turning out blurred now. I am using the Nikkor 18-55mm lens that came with the camera. The f setting only goes down to 3.5 when on the 18mm and like 5 when zoomed all the way out to 55mm. Help!! This doesn’t feel creative! It feels more like epic fail. I was afraid of trying anything other than auto for this very reason! What am I doing wrong? I just got the Nikon D3300 and I am having the same issues, were you able to figure it out ? Very good article…just purchased a new Canon SX50HD and trying to learn all about it. During my experimenting taking photos, I did not write down the settings used. Is there a program, s/w or app for Mac computer that will show the settings used for my photos? Thanks so much my mom bought me a camera for my 19th birthday last week and i thought it would be a good thing to get into being that i am an artistic person. This will help me alot, i will come back once i have atleast tried the basics. On the Mac, the replacement for iPhoto is photo and photo also shows settings under the i at the top of the page. I shoot in Av mode 99% of the time with my canon 70d. The first step to acheive a faster shutter speed is to open your apperature to your maximum f stop( the smallest f number) as long as you do not care about depth of field. The image may not be quite as sharp at f/4 as it would be at F/8 but it is just a slight difference. The next thing to do is raise your ISO. you can also ajust your exposure comp down a little wich will darken the picture slightly but will help you maintain a faster shutter speed. You can correct the brightness in post production with programs such as adobe lightroom or adobe photoshop. I know this is an old thread, but I also have a 70D and wanted to chime in to comment on this continual advice for AV priority mode. It doesn’t really matter which model camera you have, I would highly recommend going to full manual mode for just the reason you stated. You don’t want the camera choosing your shutter speed. It’s so fast to just turn the dial at the top of the camera to adjust the shutter speed. Put your camera on auto white balance and auto ISO. Choose the desired aperture you want, then the shutter speed, the ISO will take care of itself. You can do this super fast once you get used to it. It won’t take long to figure out what shutter speed will give you sharp photos. When I’m using the kit 18-135 kit lens, I’ll often shoot with the widest aperture, and go for at least 1/125 on the shutter speed when shooting handheld. It is not uncommon to choose much quicker than that. Watch your exposure range dial and just keep it in the middle for now until you learn about blowing out highlights. You are a genius.. I have gone through 100s of blogs so far and even youtube videos. But your articles are so easy to understand, you might not enjoy that much while writing it but people would surely love reading it.. I found you through a pin, and for what I’ve just read, I’m sure I’ll be coming back a lot. Thanks for sharing this. Greetings from Guatemala! I’ve read a lot of this abc 123 and this by far is the best I’ve ever read!! Good job sir! Cheers! Thanks very much for your help. I have been nominated as a photographer for a school trip to China (I’m a teacher) and your site has given me lots of useful guidance that I look forward to using!